SphereOptics provides a large spectrum of ultra-lightweight reflectance targets. The Zenith LiteTM targets are built from a 1 mm or 2 mm Zenith Polymer® diffuser attached to a 10-15mm thick aluminum honeycomb structured plate by special PTFE high performance glue. The laminating technique allows multiple reflectivities on one target with no visible seams (max. width 1040 mm). 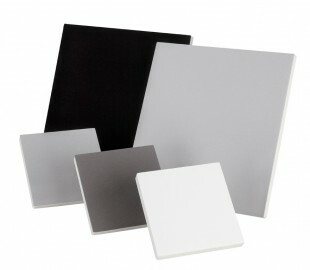 Targets can be made to any size and combination of white and grey scale reflectivities. The unique backing can be drilled for easy attachment to other mounting devices.